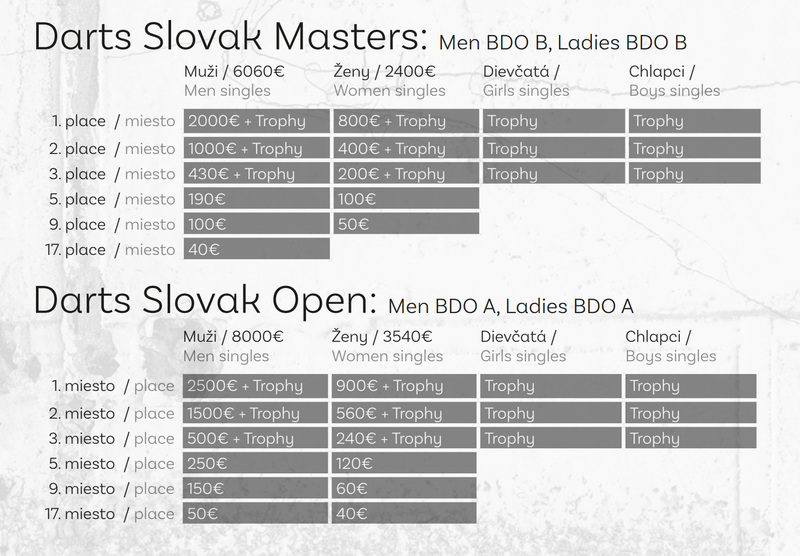 All prizes are subject to income tax, according to Slovak law, and will be collected by the organizers from the above mentioned amounts. This tournament counts toward rankings on the BDO Invitation Table and any player eligible to compete at the Winmau World Masters and Lakeside World Professional Championships can enter. Junior players, those born on or after February 22, 2003, may also start in adult competitions. WDF rules apply in individual competition categories. The organizers reserve the right to change scheduling and the playing format. Players will not be announced. Each player should check the draw sheet displayed to learn where and when they will be competing. A player who fails to show up on time to compete will forfeit the match. Players who fail to attend the winners’ ceremony forfeit all prizes. Players appearing on stage are expected to dress appropriately. Jeans, denim trousers, jogging suits, sweatshirts and headgear are not allowed. No smoking or consuming of drinks and food are allowed in the entire playing area. After the second warning, players will be disqualified. Matches start with a throw at the bull’s eye. The player who comes closest starts the match and all odd-numbered legs, including any potential deciding leg. A coin toss determines the player to throw first. Each player throws 9 darts. All questions about scoring have to be settled before the player’s next throw. The losing player marks the next match on the dartboard where his or her own match was lost. 501 DO (start at 501 and check out with a double or bull’s eye). KO (single elimination). Best of 7 legs, Best of 9 legs starting at the Round of 16, Best of 11 legs for the final. Best of 7 legs, Best of 9 legs starting at the Round of 8. Best of 5 legs, Best of 7 legs for the final.